This is the wonderful exchange I received from my HoE exchange partner. It actually arrived before Christmas, but due to the business of the season, I have only just now gotten around to posting this pic. 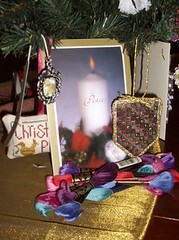 I received a gorgeous ornament (the one in the foreground), some wonderful floss and a silver bookmark with a small photo frame. I really love the entire set, and the ornament has been sitting proudly on my exchange ornament tree. I have to remember to get some photos of it before I take down my tree this afternoon. Thank you very much Jayne.